Feel beautiful with a personalised 14k gold necklace made especially for you! 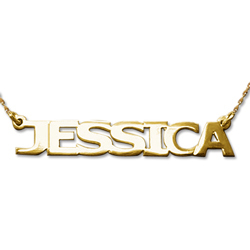 Please Note: The turn-around time for your personalised, custom Name Necklace is up to 3 weeks. Please allow for this - especially at busy times such as Christmas. We are unable to process urgent orders for Name Necklaces.